I help out on a farm. 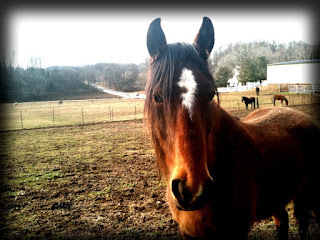 I'm not sure if I've mentioned it before, but we're primarily a Tennessee Walking Horse establishment. There are a few boarders so we have a couple of rescued Thoroughbreds and a few quarterhorses (including my buddy Arthur! ), and even a couple of ponies with all the attitude and swagger they bring (Oh, those ponies!). 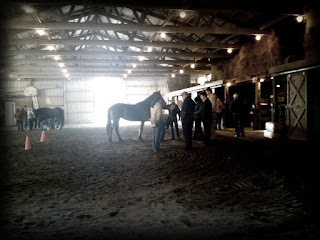 This weekend Hal, the owner, hosted a clinic at the farm for training new inspectors on what to look for when checking a Tennessee Walking horses' hooves. Because there are people out there who torture them with acid (called "soring") among other awful things to get the exaggerated gait that you may have seen before. Horses do not move this way naturally. Until a few years ago I didn't know this was how it was achieved, and maybe you didn't either. It's disgusting to see once you realize the pain these babies go through to make them walk like that. The Walking Horse Association is diligent about catching horses that have been abused. Owners who abuse their horses are not allowed to show them in the association's events. That's what this clinic was about, training inspectors on what to look for. It's an intense process and those who attended were instructed ever so carefully. 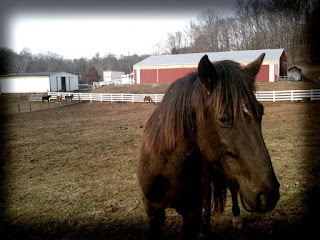 Hal has rescued many horses that were tortured, like John Henry here. When John Henry came to Hal, someone had used acid on him and he was in really bad shape. 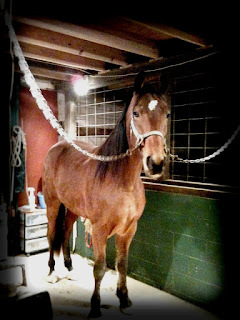 Hal took the time to get him back to health and now he's a show horse, with his own beautiful natural gait. It took years to undo most of what had been done to him, and mentally some of it will always be with him. I think changing his mental view of humans is what took the longest because he'd learned that humans were the source of pain. He didn't trust, understandbly. Now he's a loving, sound boy because of the time that was spent retraining and building the trust back. If you ever get a chance, you should go to to a Walking Horse show. They're incredible to see. I also hung out a bit with these two this weekend. And Little Boo, who I want to be mine. I love him and his reddish tinged mane. We're going riding together this summer. I've also got new work to show soon, yes I am still a designer and fabricator of jewelry! I looked back and realized that most of my recent posts have not had any jewelry in them. For shame! It's wonderful working on this farm. Hal shows Walking horses and is passionate about the treatment of them. When I first heard about the acid I couldn't believe it....until I talked to someone who actually did it. They don't believe the horse is caused that much pain by doing this, and if they do believe, they don't care because it's about the money. MLJ, I LOVE Knoxville! I make it up there as much as possible (and around the corner to the Smokies too~). Cheers to you! I wish I were there to help! I love that you're doing what you do.... I think people who help animals are angels on earth. Thank you ladies! I feel like I need to clarify a little.... While Hal has helped many horses, it's not the sole mission of the farm to save horses. Hal also shows Tennessee Walkers (there are several champions on the farm!) and since he's been in the business for a long time, he sometimes hears about horses in bad shape and will do what he can to help them. And of course he's instrumental in promoting "sound" horses and humane practices in training as mentioned in the blog post. I love working on this farm with Chris and Hal, they've both taught me so much about horses (riding and taking care of them). I never really considered before that I'd be a farm hand but I love it! Show season is starting up, get your boots on! It's wonderful what you and Hal have done to help these horses. They are all gorgeous creatures. I can't wait to see your newest creations. Ask, and you shall receive?